It’s back to the domestic front this afternoon for Manchester City after their thumping of Feyenoord on Wednesday in the Champions League. Today, Pep Guardiola’s men face a side they thrashed 5-0 in last season’s equivalent fixture, but who are now coached by the talented Marco Silva, a tactician who has the Hornets unbeaten four games into the season. 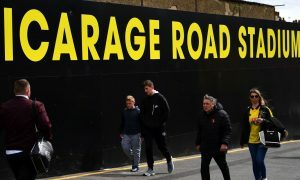 It promises to be a tougher away day for City than last time they visited Vicarage Road in May, but after big wins over Liverpool and Feyenoord, confidence is sky high in the camp.